Many years ago when I was still very young, a senior seminarian was posted on apostolic work in my parish and fortunately he was asked by the parish priest to stay in our family house. I can’t remember his name or his face but his excellent conduct is still very clear in my mind. Being a junior seminarian I naturally became his close associate and guide. One of his major duties was home visitation and it was announced that he would be visiting various families in our area beginning with a particular family. What happened on the first visitation thrilled me. By the time we came to this family we met the father of the house and two of the male children in the living room. When the senior seminarian asked after the mother of the family and the other children (who happen to be females) the father said that they were preparing some delicacies for the August visitor. The Seminarian was not in a hurry to unpack his message to the family even when the father of the house asked him to start with him and the other two children. After a moment, the living room was saturated with pleasant aromas from various dishes which the mother of the house and the girls dropped on the dining table in quick succession. I began to salivate! In a moment the mother of the house appeared to announce that the dinner was ready. I wanted to stand up to show the senior seminarian the way to the dinning but I exercised caution to allow him stand up first. He stood up but to the amazement of all he asked the mother of the house to call the other children so that he can first talk to everyone and pray for them before the dinner. Well in my young mind I prayed that he could do that fast so that we can have some food. His sermon was unfortunately long as he took time to teach morals, issues about attending to the sacraments, maintaining peace at home and other interesting themes. He concluded with a long but interesting prayer. The next was to go to the dining table to deal with the hot and sizzling dishes. But he announced that it was his usual practice not to eat in people’s houses on such pastoral visits and his reasons were cogent enough. For him if he eats in one family it will be just fair to eat in all the families he would visit. Furthermore people will begin to dwell more on preparing delicacies instead of listening to his pastoral message and instructions and finally he will be so filled that he may not be effective in the work. The family was so disappointed that he could not even take a piece of meat after all the effort and he would not even allow me to eat as we had to go immediately and I was not happy with him! It was years later that I understood what he did and that became my style as a senior seminarian. Extensive research has shown that there is an age long tension between the spiritual and the material, the temporal and the eternal, and if you like the “MARY” and the “MARTHA” in us. In the face of this tension we are left with just one disposition and that is TO MAKE A CHOICE! Many people are agreed to the fact that life is all about the choices we make and it is instructive. We chose either to do this thing or that thing. We chose to eat or not to eat; we chose to say or not to say. Any choice we make determines the result we get. People are happy or sad today on account of the choices they make; it could be in business, marriage, profession, projects and so on. If we go back to the situation that confronted Adam and Eve in the Garden of Eden we discover that it was simply a matter of choice. Eve had a chance to eat or not to eat the fruit at the middle of the Garden. Adam had an opportunity to make a choice to take or not to take the fruit from Eve. They generally had the opportunities to choose between the material (the fruit at the middle of the garden with the consequence of death) and the spiritual (God’s instruction with the reward of eternal happiness with God). They had the chance to make a choice between the “Mary and Martha” in us. In the first reading today, we see Abraham our father in faith encountering God at the Oak of Mamre in the hottest part of the day. He looked up and saw three men (a pointer to the three Persons in one God) and he ran to them and bowing down he said “Lord do not pass your servant by if I have found favour in your sight” (Gen.18:3). If we look at the scenario very well we will discover that Abraham simply made the choice of running towards the visitors and inviting them to his house; he could as well have allowed them to pass by after all the sun was too much! He went for his “Mary” (the spiritual; that is God) and with that he was able to receive his much awaited “Martha” (that is Isaac). The gospel tells us about the visit of our Lord Jesus Christ to the family of Mary and Martha sisters of Lazarus. 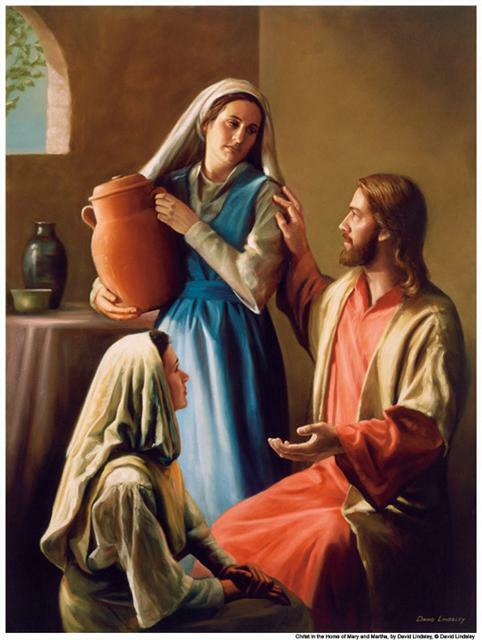 When our Lord Jesus Christ entered the family house the two sisters made their respective choices. Mary chose to sit at the feet of our Lord Jesus Christ to listen to the precious words coming from his mouth while Martha took to the kitchen and busied herself with cooking and serving of the best delicacies ever. It will be worthwhile to establish here that none of them was wrong in their respective choices as their choices were worthwhile. On one hand there should be food in the house especially as an important person was visiting and on the other hand someone had to listen to the one who had the message of eternal life (John 6:68). However among the choices they made one was better than the other; the choice of Mary to stay at the feet of the Lord (a sign of submission and discipleship) and listen to him. The contention arose when Martha wanted to justify her choice as more deserving than that of Mary by complaining straight to our Lord Jesus Christ. However his answer unmistakeably put Mary in the position of the one who made the better choice: “Martha! Martha!! You worry and fret over many things but only one thing is necessary and Mary has chosen the better part and it will not be taken away from her”. The response of our Lord Jesus Christ to Martha is a lot reflective of the instruction he gave earlier in the gospel of Matthew (6:33) where he said “seek first the kingdom of God and his righteousness and all these things will be added unto you”. If we give an attentive reflection on the above we could hear our Lord Jesus Christ actually telling us to give priority to the “Mary” in us and the other elements of “Martha” will be given to us. The most unsettling problem in our world today is that we are so much distracted from the “Mary” in us and get so intensely attracted to the competing “Martha” in us. Put in a simplified form we are often disconnected from the things of the spirit and get easily attached to material things. To make the foregoing even clearer some of us for instance have two or more mobile phones and use them on hourly basis but cannot boast of a functional bible (some actually have bibles that are not functional). Most of us are attuned to making and receiving call, sending and receiving messages through various means of modern communication and new media but we can scarcely spend two minutes of our time for prayers unless there is a special problem facing us. Some of us spend hours in the cinemas and more hours watching television at home but find going to the Church or making a visit to the Blessed Sacrament as burdensome and discomforting as climbing a high rugged mountain. In all these things we are simply making our choices! As we respond to God’s call this week, let us be attentive to the fact that making a choice to put the “Mary” in us in the first place will serve to bring about transformation in our lives. Like Martha many people come into existence and later pass on worrying and fretting over many things that do not matter when only one thing is necessary; our deep knowledge of God. We remember that our Lord Jesus Christ instructed that it will not be profitable for anyone to gain the whole world and suffer the loss of one’s soul (Mark 8:36). The value of today, tomorrow and indeed our entire life time depends heavily on the choices we make for either the “Mary” or the “Martha” in our lives. The choice remains yours. Have a blissful Sunday and a wonderfully blessed week! ← THE GOSPEL OF MY NEIGHBOUR AND “GENOVESE SYNDROME”: HOMILY FOR THE 15TH SUNDAY OF THE YEAR (C). Rev. Fr. Boniface Nkem Anusiem PhD. Nice Homily Father….. I waz inspired by it….. Thank u for d beautiful sermon. May God’s grace be sufficient to seeing u to that glorious height that He desire of u; may He bless your ministry; and keep u strong, always. (Amen). Thank you so very much for this wonderful reflection, it really enriched my perspective in looking at the two personalities of Mary and Martha which actually need integration. Your reflection enriched my homily. Well done Fr Bonnie. Lovely reflection! quite enriching too. The example on the choices we make especially with time spent on mobile phones and social media is so apt. making a choice today to devote more time to the Mary in me. Thanks Father, God Bless.